The common marmoset (Callithrix jacchus) is a very small New World monkey that lives in Brazil. Marmosets can found in many forest habitats. Common marmosets eat gum, sap, latex, and resin from trees the most out of all the members of the Callithrix family. A common group of marmosets is made up of 15 members, but usually has nine members. Common marmosets have a complex mating system. In a group of marmosets, there will usually be one or two females that will have babies and one male to be the father. The females are usually closely related, while the male is distantly related. If the male dies, the group will break up and form new groups. When marmosets get older, they leave the group they were raised with. It is not known why. To show fear or submission, marmosets flatten their ear-tufts close to their heads. Marmoset alarm calls tend to be brief and high-pitched. Marmosets monitor and find group members with calls called "trills". ↑ Kinzey WG. 1997. "Synopsis of New World primates (16 genera) ". In: Kinzey WG, editor. New world primates: ecology, evolution, and behavior. New York: Aldine de Gruyter. p 169-324. ↑ Rylands AB, de Faria DS. (1993) "Habitats, feeding ecology, and home range size in the genus Callithrix". In: 'Rylands AB, editor. Marmosets and tamarins: systematics, behaviour, and ecology. Oxford (England): Oxford Univ Pr. p 262-72. ↑ 6.0 6.1 Stevenson MF, Rylands AB. (1988) "The marmosets, genus Callithrix". In: Mittermeier RA, Rylands AB, Coimbra-Filho AF, da Fonseca GAB, editors. Ecology and behavior of neotropical primates, Volume 2. Washington DC: World Wildlife Fund. p 131-222. ↑ Ferrari SF, Lopes Ferrari MA. (1989) "A re-evaluation of the social organization of the Callitrichidae, with reference to the ecological differences between genera". Folia Primatol 52: 132-47. ↑ Lazaro-Perea C. (2001) "Intergroup interactions in wild common marmosets, Callithrix jacchus: territorial defense and assessment of neighbours". Anim Behav 62: 11-21. 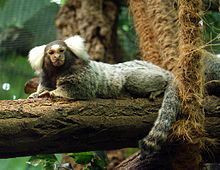 Wikispecies has information on: Common Marmoset. Lang, Kristina Cawthon (2005-05-18). "Common marmoset: Callithrix jacchus". Primate Factsheets. Primate Info Net. Retrieved 10 April 2009. This page was last changed on 8 April 2015, at 13:45.